When Mitch Morecraft walks across the stage to receive his diploma at Southern Illinois University Edwardsville’s May commencement, it’s his parents that will be forefront in his mind. As a first generation college student, the achievement is what his parents have always wanted for him, and one he’s worked hard for. “My whole family is coming,” Morecraft said. “Their support has been the most important thing to me, whether it's financial support or moral support, it’s been what's motivated me to make it all the way through and persevere. “My parents have worked hard, they’ve sacrificed and they’ve truly made an effort to give me more opportunities than they’ve had,” he added. 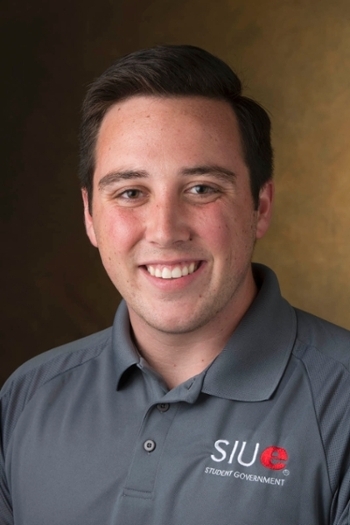 Morecraft, a Marshall native, will graduate with a bachelor’s in business administration with a focus on international business and entrepreneurship. A Spanish minor will further enhance his future success. Morecraft plans to begin his professional career as a commercial real estate broker. But his aspirations involve more than wearing a business suit for the rest of his life. Along with academics, Morecraft committed many hours throughout his college career to extra-curricular activities and organizations, including student government. He served as the student trustee on the SIU Board of Trustees during 2014-15. More impactful than any of those commitments he says has been the people he has met during his time at the University. To summarize his collegiate experience, Morecraft says he is grateful. He’s grateful to his parents for their encouragement and unwavering support, and he’s thankful for SIUE. “I’m grateful that the University has given me the opportunity to do things that I never thought I could, and go places that I never thought possible,” he said.